With the rise and rise of millennialism and streetwear, brands this season revived their signature styles to suit (and un-suit) this burgeoning social media-entranced audience. Think innovative design, languorous silhouettes, and graphic branding. Inspired by nature, paganism, explorers, pioneers, and survivalists, Sarah Burton’s collection echoed her fascination with nature and folklore. The idea was to celebrate natural forces and be a part of it, which came through precisive tailoring and rugged touches on hand knit sweaters. 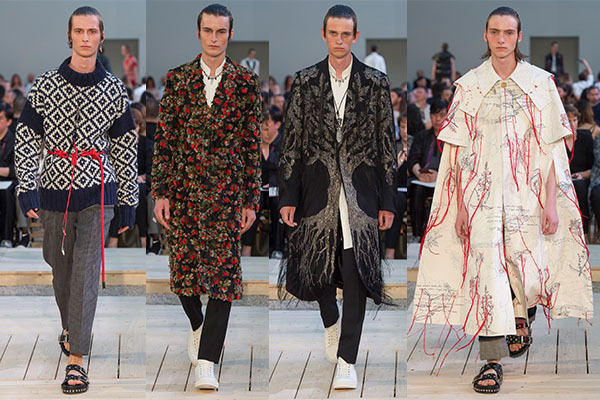 Trailing threads were the trend for a raw, unfinished look; on one coat forming a literal ‘tree of life’. Even through chunkily anachronistic, the collection was as good as wearable art. 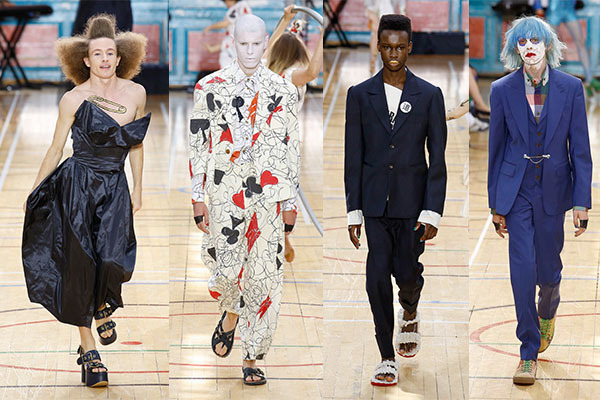 Demna Gvasalia shed his attraction for the sharp-shaped, masculine business executive from last season and paid homage to dad-hood. The collection, aplenty with Hawaiian shirts, droopy field linen jackets and coats with exaggerated proportions and acid-washed jeans revisited the early ’90s, as if to make the ‘uncool’ cool again. With slogans like ‘Think Big!’ and ‘The Power of Dreams!’, Gvasalia comforted the audience with the vision of an optimistic future. 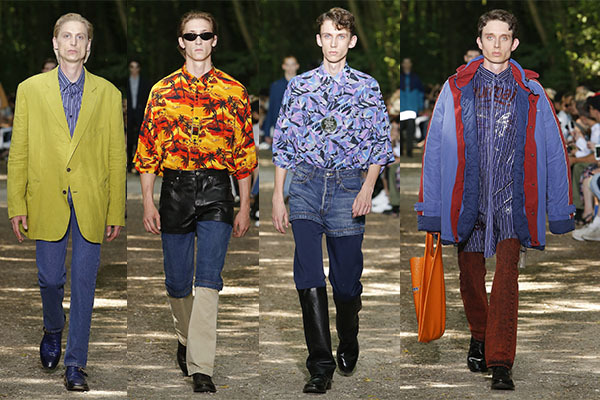 Celebrating a decade at the helm of the label, Kris Van Assche’s collection reinvented Christian Dior’s ‘New Look’ (which is also celebrating its 70th anniversary this year), in a bid to make it relevant to the new generation. As witnessed on the teenaged models, Assche added a powerful and romantic subtext to the black suit and white shirt — a symbolism of growing up and becoming aware of how clothes can turn heads, and the narrative crossed into varsity-wear with bomber jackets. Shirts painted by François Bard ranged from portraits of young men in hoodies to white orchids. 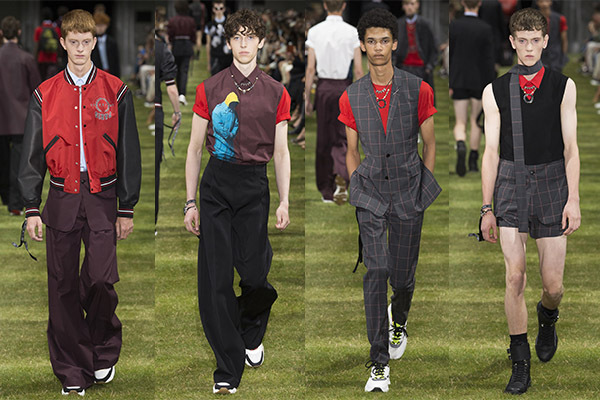 The tailoring was coded with logos, streamlined, and subtly androgynous. 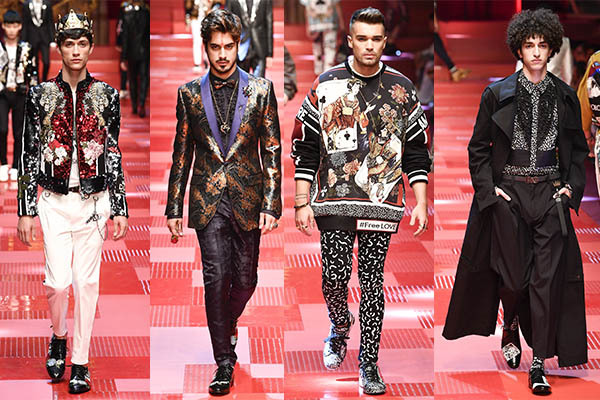 Banking on their Insta-famous millennials with skyrocketing social media credentials or celebrity genes for their show, Dolce & Gabbana had an eclectic collection reviving prints and tonic colours from 50s teenage proms. 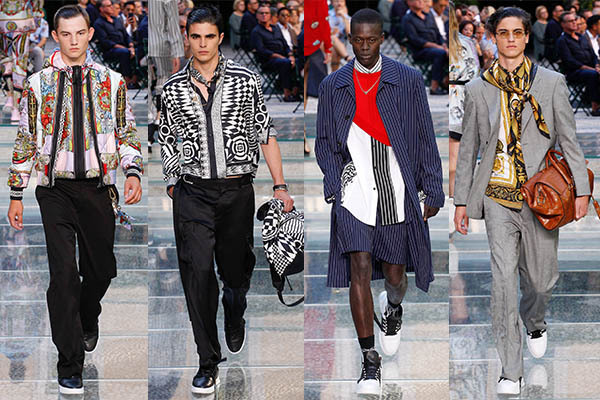 Inspired by the Memphis design movement (born when the designer duo was starting out themselves), there were hand-painted jeans, embroidered bomber jackets, sequined playing-card king motifs. However, on the insides were hiding “PROTEST” in block capitals along with “D&G GIVE ME FREEDOM”, with playful irony. Inspired from the Indian subcontinent, Etro presented their collection based on Kashmiri and Madrasi motifs with prints from the Kama Sutra. From oversized paisleys to beaded mandalas on fabrics such as wool and linen-viscose; each piece revered the spirituality and vivid iconography of the country. Fendi’s collection was a fine combination of the banal and provocative. Silvia Venturini Fendi collaborated with artist “Big” Sue Tilly to create art prints of Andy Warhol in executive drag and Christian Bale in suspenders from American Psycho. 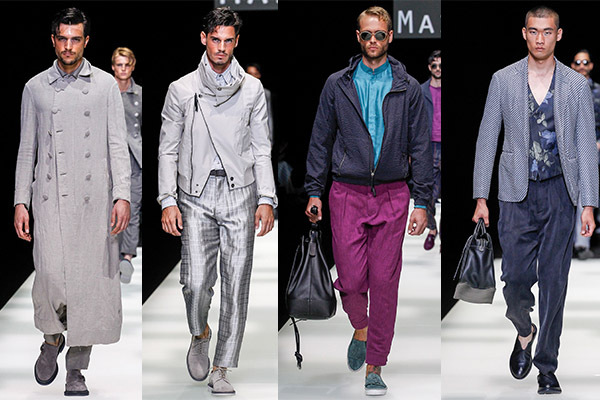 They featured on luxe-casual pleated pants, suits with sportier shorts and baseball jackets. Trying to unleash businessmen from their boxes of rigid masculinity, this collection pursued a new normal. “Made in Armani” read the opening one-liner at the show, echoing a collection from the Armani state-of-mind. With 40 years of fine, Italian pedigree behind him, he revived signature styles defined primarily by 50 shades of light greys, stones and silvers along with jewel-tones, covering an array of textures and fits. 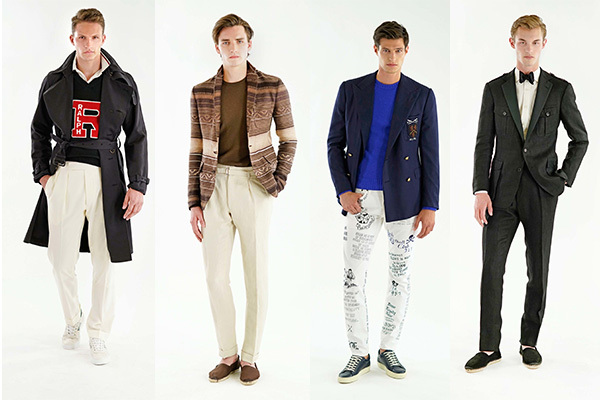 Carrot trousers, figure-hugging jackets, long double-breasted trenches, high-cut peacoats; all signifying languorous work-wear meditated with eastern silhouettes in linen, wool, seersucker, and jacquard. Jonathan Anderson has always followed an avant-garde, socio-cultural effervescent direction, but for this season, he turned to the mirror to weave a personal fantasy of what he would like to wear. 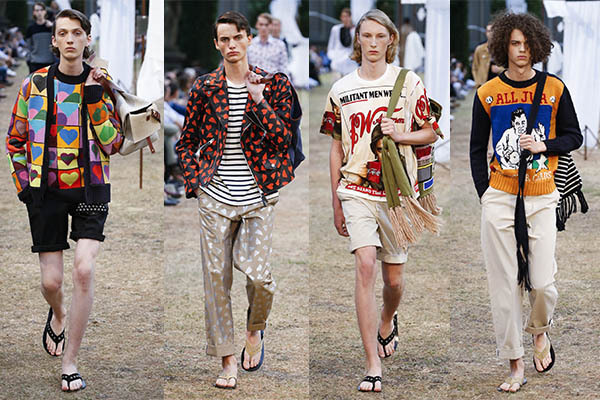 The show’s backdrop of a Florentine garden rolled out models in summery lightweights; breezy trenches, sweatshirts, wide-legged jeans, chinos, denim shorts, and sweaters sharply holding the label’s logo. The details stood out such as crafty appliques, Pop Art-tinged patchwork, and origami folds. 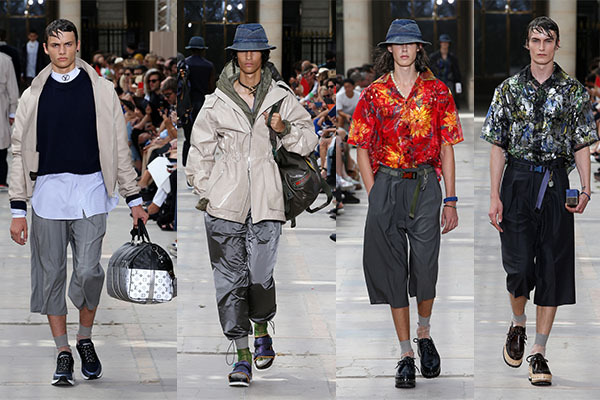 While designing for this collection, Kim Jones had an odd inspiration; “The Atlas of Remote Islands: Fifty Islands I Have Not Visited and Never Will”, but managed to put the Hawaiian shirt back on the style map. This island-hopping journey combined scuba diving and surfing gear with relaxed tailoring (of Hong Kong) yet convincing silhouettes. Tropicana shades with elements of vegetation from the South-Pacific Islands and glossy textures were aplenty. What stood out? An inky-bonded leather and neoprene jacket, a fleece-effect brushed shearling bomber and a high sheen off-white oversized raincoat. All we could think of was, bring on the monsoon. 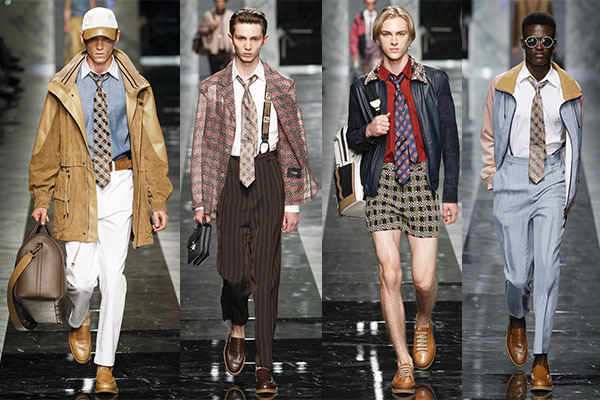 In an increasingly digital world, to highlight the human talent of reality was the goal of Miuccia Prada’s collection. Taking the graphic novel as a prime example, she put out a show in comic-poppy colours of red, black, pink and olive. There were high-waisted pants snugged with thin belts, shirts, cardigans, jumpsuits, suits and of course, lots of Velcro, nylon, herringbone, and wool. Almost all had a graphic aspect in the form of panels and illustrations. Perhaps in world dashed with ennui, this was Prada-power to the rescue. Inspired by vintage racing styles such as the ‘Tour de France’, Ralph Lauren’s collection was versatile in its diversification with a running theme of relaxed elegance. A plethora of custom lightweight fabrics such as silk and linen chambray lightened even the dinner jackets. Textures such as houndstooth and ombre were an added dimension. A feeling of heritage could be found in linen, military, and vintage RAF jackets and sweaters. Tom Ford welcomed spring in psychedelic delirium with wide-lapelled skinny suits with ties in odd but gorgeously combined tones such as pinks, blues, corals and rich reds. Putting a twist on the classic dinner jacket, his collection was filled with suits and jackets in linen, suede, denim with added layers of shawls and white-tipped collars, all nodding to the 70s. 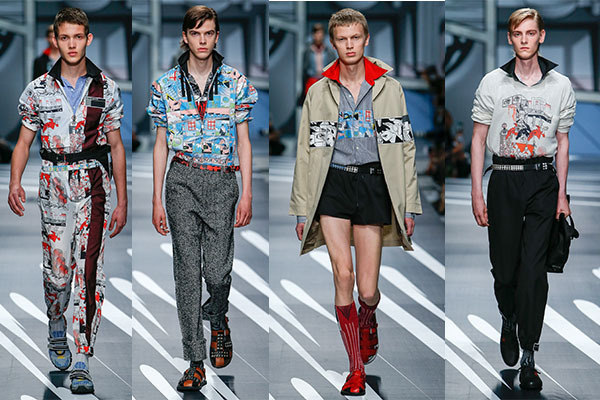 Sporty pieces, cowboy-style jackets were paired with cargo pants and skinny jeans. 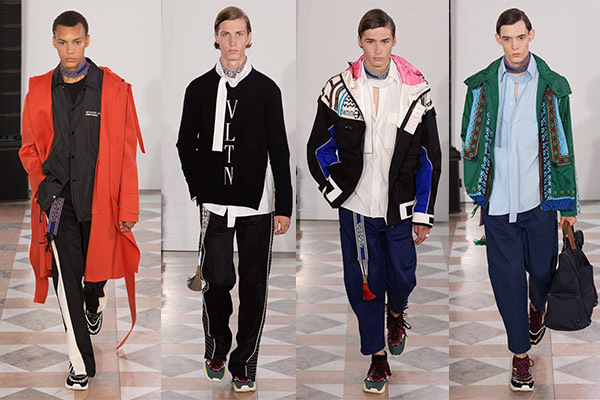 Sports and streetwear met craft at Pierpaolo Piccioli’s collection for Valentino. Inspired by Jungian psychology, Piccioli revived an old VLTN monogram from the 80s and set out a casual-wear line tinged with self-expression. Even though there wasn’t a single suit in sight, the luxed-up tracks suits were finely embellished. Outerwear was not left behind with their geometric central-American embroidery on lightweight leather, blended nylon and mesh. However, being the accessory designer he is, each pair of shoes was an individual kind, with metallic textures, zig-zags and other symbols. Celebrating the 20th death anniversary of Gianni Versace, this show was a homecoming. Reviving prints, colours and patterns from the early Gianni years, the collection was letting its millennial audience know of their early interests. Bright silk shirts, mythical patterns, pinstripes, and swirls adorned clothes in colours ranging from soft pink to baby blue. What stood out were the check suits and chains woven like pinstripes on the jackets. It was vintage Versace through a millennial lens. Like always, Westwood stuck to her convictions of portraying social activism through her clothes. With climate change and the ‘end of the world’ on the brink, her show was energetic and impactful. Finely tailored suits and long coats, narrow and cuffed trousers, cool knits, hemp and of course, Westwood’s signature drapery implored us to ‘Buy less, choose better and make it last’. Unconventionally significant is what no one can do better than Westwood.